According to a report published today, production of the Apple iPhone 7 has started at facilities owned by contract manufacturers Pegatron and Foxconn. The report cites a tipster who added that three variations of the iPhone 7 are being manufactured. There will be the regular model, an Apple iPhone 7 Plus and an Apple iPhone 7 Pro or Plus Premium. There has been talk about a version of the iPhone 7 Plus with a dual camera setup on the back, Previous rumors had this being offered on the iPhone 7 Plus, or on a new "Pro" version of the phone. One rumor suggests that there will be a pair of 12MP lenses on back. One will have OIS while the other will offer 2-3x optical zooming. Last year's purchase of Israeli imaging company LinX figures to loom large in any new camera setup for the iPhone. Recently there has been talk that the next iteration of Apple's smartphone would not feature many new changes. KGI Securities' reliable Apple analyst Ming-Chi Kuo has stated that the iPhone 7 will not have many 'attractive selling points.' The latest speculation calls for Apple to skip the iPhone 7s in 2017, and mark the 10th anniversary of the product with a redesigned Apple iPhone 8. The 2017 version of the iPhone is rumored to have an edge-to-edge screen that covers the whole front of the device. TouchID would be embedded inside the screen along with the front-facing camera and the speakers. Other changes that have been talked about for next year's iPhone include the use of a curved, AMOLED display (although another report has this coming in 2018). You might want to head over to your pantry, and take all of this with the proverbial grain of salt. Perhaps someday we will see an iPhone like the concept model that a local reporter for a FOX affiliate mistook for the real Apple iPhone 5. She did this during a live news broadcast back in 2012. You might have seen this clip before, but it is always good for a laugh. Check it out by tapping on the video below. Rejoice! "iPhone 6S / 6S Plus and SE prices will soon drop!!!" Bring on the 2017 iPhone. If iOS 10 runs fine e on my 6 plus, I will not be upgrading this year. So it sounds like you're expecting it to run perfect? Seeing as the Apple devs have wasted 7 months trying to get iOS 9 patched over and over again for 10 times, they weren't left with much time to really work on iOS X. Also, if it running crappy is what it takes tou get iOS 10, then that's sad. If you want iOS 10 in its best form, buy the phone with it. This is what is so great about Android. Even though the carriers take an extra 3 months or so to bring an update, when it comes they tend to have no problems. When they do, they seem to be carrier related and my experienced show them to be fix pretty fast, based on my experience with Verizon. I've never had an update crash, ruin a phones performance or wipe any data on Android. Can't say the same for iOS though. The carrier's don't take an extra "3 months" fam'. It's been over half a year, and many users are still waiting for Android MM with N around the corner. The reason you don't here about the bugs Android MM has is because a meager amount of the population actually has a phone running it. 7.5 % to be exact, which is rather awful might I add. Android isn't perfect on the software side either. Well android lollipop provides everything that ios 9 can. Marshmallow adds doze mode mainly. Android N would mainly bring Vulkan. I do know know why people make so much fuzz about updates as if an update will change your whole phone. That happens rarely. I want to know how many flagship users are running latest Android. It still won't compare to iOS but would make fair comparison. Entry level phones should not be put on a same league as flagship iOS devices. "I've never had an update crash ruin a phones performance or wipe any data on Android" Are u drunk? Android crashes and lags without any update. so iPhones do not lag?? Send me you mail please.. I wanna send a video that my friend himself recorded on his brand new iPhone 5s about 6-7 months ago..
That's not Android. It's your laggy brain processing the visual input. So you have tried every Android phone there is ..... no. It is easy to try all iPhones and in comparison to the Android phones I have used. They do no lag any more than an iPhone and tend to be more stable. IOS updates are like playing Russian roulette with your phone so overall stability is superior on the Android phones I have used. What part of "if" dont you understand? By the way, iOS 9 works fine on my phone book boy! Your ignorance and bias for Android never ceases to impress me. I'm trying to understand you, why you harbor such hate for a mobile operating system. I'm beginning to think you're a failed AI experiment run amuck. Iphone , iphone 3g, 3gs , 4 , 4s ,5 , 5s, 6 , 6s ,7... This year is 10s anniversary! Steve Jobs introduced the iPhone on January 9th, 2007. Surely you read this on PhoneArena that very day: http://www.phonearena.com/news/Apple-iPhone-is-real-and-coming-to-Cingular_id1730 Regards, Alan F.
The 10th anniversary is the amount of years, not units dummy. You lack sense of humour. 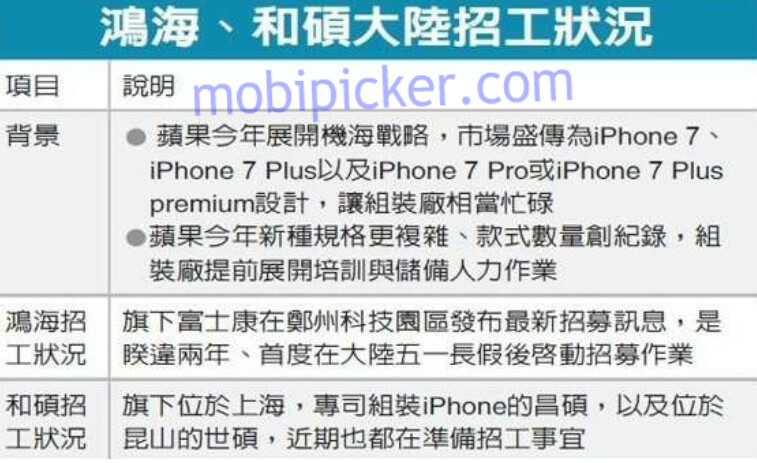 And there's a iPhone Premium (Look at the photo, there's a "Premium", starting from $4000. The best? Debatable. But yes you need more money to get one new feature every model and yet the price keeps increasing. You made the same points I have. The iPad Pro went up $100. Yet they removed one core from the Tri-Core CPU that was in the Air 2. Why? NO EXPLANATION GIVEN. They added 2 speakers that are all in terrible locations. Well let me correct that, they cut holes for 4 speakers, but it sounds like there are only 2 actual ones. They added nothing else. The iPad Pro 9.7 has no extra features the Air 2 can't do. There is no "3D Touch", the fingerprint reader in my experience is slower than it is on the iPhone 6S and they bumped up the rear camera. But none of that justifies a price increase. Apple is full of Crap. I'm actually going return it. It isn't worth the cost. Will just go one eBay and get a Mini. Maybe! Why Apple decreased the number of cores ? Who knows ! But A9X is much faster and more efficient and I found that important, not the number of cores. Why you need explanation for that ? And that quand audio is better than any typical nootebook, not even talking about tablets. What's your problem then ? Wait. Everyone is praising the iPad Pro for the great audio it offers with the new 4 speaker set up. iPhone 7 Pro here I come!! Should be epic. I'm very curious as to how it will look. Me personally, don't much care how it looks. I put cases on all my phones anyway. Then again, I'm a function over form kinda person I guess. I'm not expecting anything drastically different from the norm though, but they may just surprise us. So you say you are function over form. But why not both? Why choose a devic ethat give you form over function, when there are options from ALL Android OEM's that give both? I do understand some people just don't want/like Android phones and that is fine. But if function really does matter to you, yet you have or will buy an iPhone; then it a contradiction. Unless when you say function, you mean "limited function". That post is why you're not respected here. He doesn't have to like what you like, or think how you think. He spends his money how he wants, as do I. You've become more and more of a bother to people the longer you've been here, and that should bother you.